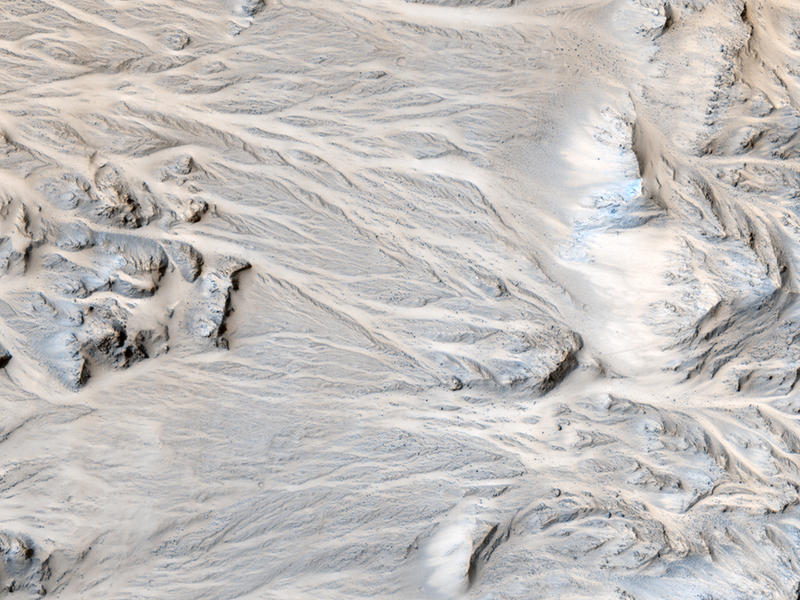 Alluvial Fans in Mojave Crater: Did It Rain on Mars? 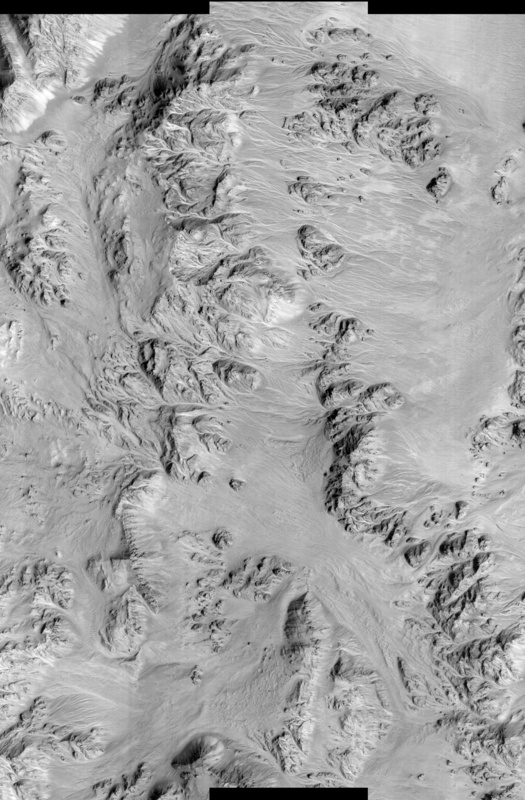 Aptly-named Mojave Crater in the Xanthe Terra region has alluvial fans that look remarkably similar to landforms in the Mojave Desert of southeastern California and portions of Nevada and Arizona. Alluvial fans are fan-shaped deposits of water-transported material (alluvium). They typically form at the base of hills or mountains where there is a marked break, or flattening of slope. They typically deposit big rocks near their mouths (close to the mountains) and smaller rocks at greater distances. 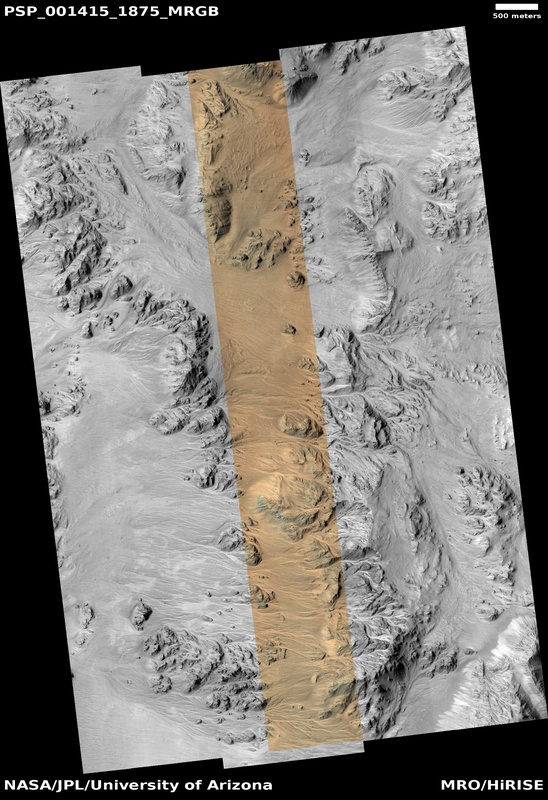 Alluvial fans form as a result of heavy desert downpours, typically thundershowers. Because deserts are poorly vegetated, heavy and short-lived downpours create a great deal of erosion and nearby deposition. There are fans inside and around the outsides of Mojave crater on Mars that perfectly match the morphology of alluvial fans on Earth, with the exception of a few small impact craters dotting this Martian landscape. Channels begin at the apex of topographic ridges, consistent with precipitation as the source of water, rather than groundwater. This remarkable landscape was first discovered from Mars Orbital Camera images. Mars researchers have suggested that impact-induced atmospheric precipitation may have created these unique landscapes. 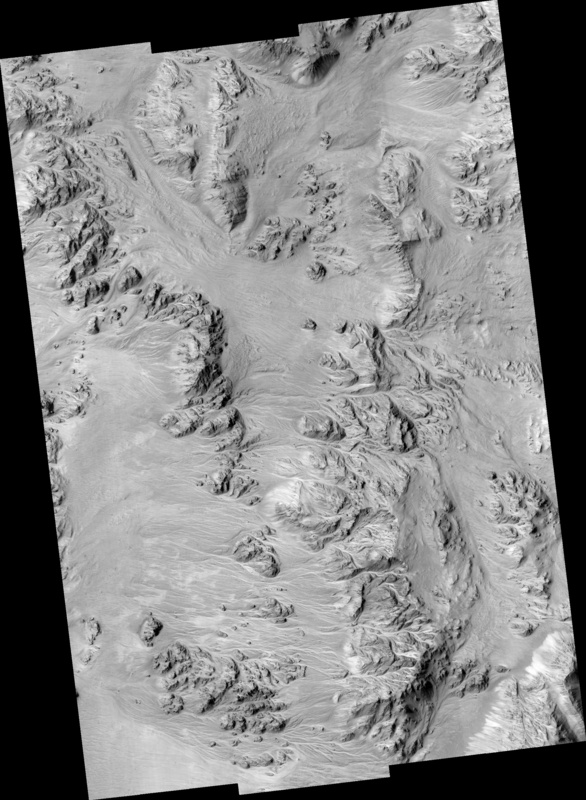 This HiRISE image at up to 29 cm/pixel scale supports the alluvial fan interpretation, in particular by showing that the sizes of the largest rocks decrease away from the mouths of the fans.